Older equipment is now very much in demand due to shifts in end markets and new options for packaging. 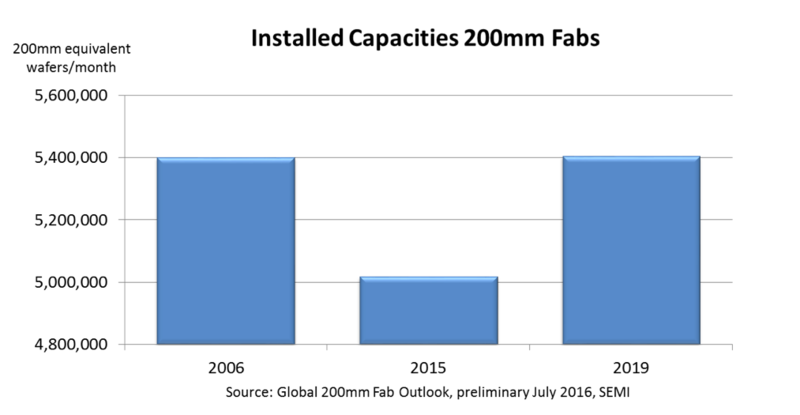 A surge in demand for consumer electronics, communications ICs, sensors and other products has created a shortage in 200mm fab capacity that shows no signs of abating. None of these chips need to be manufactured using the most advanced processes, and there have been enough tweaks to processes at established nodes to eke even more out of existing processes. But that has left chipmakers struggling to procure 200mm equipment for those fabs as demand for chips at these older nodes continues to rise. Responding to that demand, Applied Materials, ASML and Lam Research recently re-entered the 200mm equipment market. Now, these companies are making new and select 200mm tools. Other fab tool vendors are also making new 200mm systems and/or beefing up their used equipment efforts. But even with these efforts, there is still an acute shortage of 200mm “cores” in the market. “Core” is a term that refers to a used piece of equipment that must be refurbished by an OEM, third-party refurbishing house or end-user. By some estimates, there are somewhere between 600 to 720 pieces of 200mm used equipment or cores that are in inventory or available for purchase on the open market today. However, there is demand for about 1,000 200mm cores among device makers today, according to Emerald Greig, executive vice president for the Americas & Europe at SurplusGlobal, one of the world’s largest suppliers of secondary equipment. The shortages include all major tool types, such as CMP, etch, deposition and lithography. In addition, the 200mm equipment shortfall is problematic for another reason: prices are increasing for 200mm tools. For example, a large percentage of chips for automotive, mobile systems and wearables are manufactured on 200mm wafers. So how did the industry end up with so few 200mm tools? 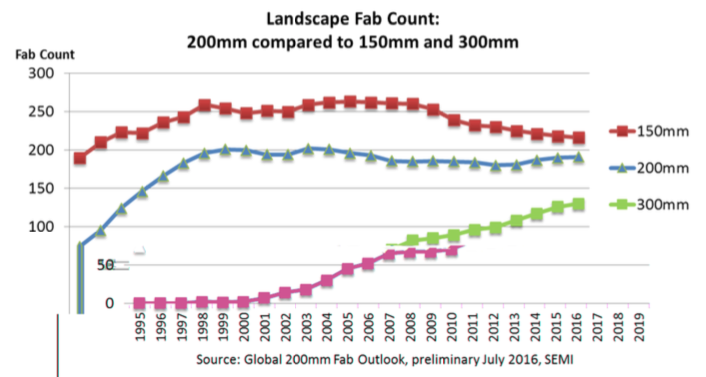 The used equipment market gained traction more than a decade ago, when many chipmakers migrated from 200mm to 300mm fabs. This, in turn, caused an excess of used 200mm gear to hit the open market. At the same time, several equipment companies went out of business or were acquired over the years. Many vendors decided to stop building or supporting certain types of tools, but there was—and still is—demand for these systems in the market. In fact, demand is increasing for 200mm chips as vertical markets such as automotive and virtual/augmented reality begin ramping. Many of these chips are analog or mixed signal, and the analog piece does not scale the way digital ICs do. To deal with the legacy gear, a plethora of used equipment companies and brokers emerged over time. And at last count, there are somewhere between 100 to 200 entities that are selling used tools today. Meanwhile, the secondary or used semiconductor equipment market has grown at a compound annual rate of 14% over the years, according to SurplusGlobal. In total, the secondary equipment market was somewhere between a $2.8 billion to $3 billion business in 2015, according to the company. But amid a slowdown in the overall fab tool sector, the secondary equipment market is projected to fall to around $2.0 billion in 2016, according to SurplusGlobal. There are several reasons for that decline. First, there aren’t enough 200mm tools to match the right application or fab flow today. Second, there was a huge wave of mergers and acquisitions in the IC business in 2015. Many of those acquisitions resulted in excess fab capacity and tools. But instead of releasing those tools in the open markets, IC vendors are generally holding on to their fab gear for future use. However, there aren’t enough 200mm tools to meet that demand. In total, there are slightly more than 600 200mm used tools or cores that are available on the open market, according to SurplusGlobal’s Greig. Of that figure, some 500 of those 200mm tools were recently released on the open market from undisclosed sources in Korea. On top of that, third-party refurbishing companies and brokers are also sitting on inventory. That inventory amounts to roughly 10% to 20% above that 600 figure, according to Greig. This, in turn, amounts to about 60 to 120 additional tools. So by some estimates, there are 660 to 720 200mm cores available today. This figure doesn’t include 200mm tool inventory within the OEMs like Applied, ASML, Lam, TEL and others. The problem? While there are roughly 660 to 720 cores in the market now, “the demand for 200mm cores is at a minimum of about 1,000,” Greig said. The emphasis, at least for the moment, is on 200mm, which is a big change from several years ago. To solve the shortfall of 200mm tools, the industry is moving in several different directions. For example, a handful of third-party used equipment companies are not only selling used systems, but they are developing new systems under their own brand names. Then, Applied, ASML and Lam are re-entering the 200mm market. Other OEMs are beefing up their new and used 200mm efforts. Still, it’s unclear if OEMs can make up the shortfall, especially in select tool markets. Generally, lithography tools are the hardest 200mm equipment to find in the used market. For 200mm, ASML has a multi-pronged strategy. As before, ASML sells an older 248nm tool for 150mm and 200mm fabs. In addition, the company can take an older ASML scanner in the field and refurbish it. What’s new is that ASML also can take its high-throughput 300mm platform, the TwinScan, and reconfigure that for a new 200mm lithography system. “If you retrofit it for 200mm, it can often give you a cost-of-ownership advantage,” Shafer said. Indeed, besides scanners, the industry wants other new and upgraded 200mm tool types, such as CMP systems, etchers, deposition tools, among others. As before, Applied Materials also refurbishes older tools. “Most of our business is refurbishing tools that have already been in the industry,” he said. Meanwhile, Lam has also restarted the production of 200mm tools in three areas—CVD, etch and wet clean. “We realize that we just can’t push everybody up to 300mm. A lot of customers have much more technology demands at 200mm now,” Lam’s Sachse said. As before, Lam also provides refurbishment services for used tools. In addition, TEL continues to make new 200mm tools, according to TEL. TEL also continues to follow the more traditional route in the used equipment arena. “We are trying to work on what we call a core-less manufacturing capability, where you can take used or refurbished parts and put together a system,” said Kevin Chasey, senior vice president of field operations at TEL. All told, each fab tool company has a different strategy. Regardless, OEMs, used equipment companies and brokers face the same challenges in the 200mm arena. For example, a chipmaker wants to procure a 200mm tool with advanced specs for a given fab flow. For this, a chipmaker can take a couple different routes—buy a new 200mm tool from an OEM, or procure a refurbished system from the OEM or a third-party. Then, the next challenge is to find a new or used tool in the market. In just the 200mm used CMP tool market alone, for example, there are less than 20 cores available worldwide, according to Mello. “There are also not many 300mm CMP tools available,” he said. Regardless, it’s sometimes hard find parts to build new or legacy 200mm tools. At times, the boards, chips and software are outdated or no longer in production. But even if one can obtain the parts, the spares and subsystems are sometimes relatively expensive, which, in turn, could boost the overall price for a given tool. “It’s a big challenge just to control the cost for 200mm tools,” Lam’s Sachse said. It’s also difficult to deal with a second-generation (or later) 200mm tool. “Those cores that are coming on the market are sometimes in very bad shape. Sometimes, you have a lot of surprises when you open the box. It makes it sometimes difficult and unpredictable in terms of how long the refurbishment process could take,” he said. There is some good news. Many OEMs and used equipment companies are hiring people who can build, service and support the older 200mm tools. The bad news is that 200mm tool shortages aren’t going away, at least for the foreseeable future. —Jeff Dorsch and Ed Sperling contributed to this report. Why big equipment makers are giving established nodes a second look. Construction is up, fueled by IoT and internal markets, but the outcome is far from clear. Efforts increasing at older nodes and with advanced packaging as end markets fragment.